What are Oliver Twist tobacco bits and how do I use them? Our tobacco bits are small rolls of tobacco, available in 6 different flavours. Oliver Twist tobacco bits are made of complete tobacco leaves and contain the amount of nicotine naturally contained in the tobacco leaves. Using tobacco bits, you avoid the harmful smoke and you do not bother others. Many use them during travels, on the job, in the car or at social events where they are not allowed to smoke. 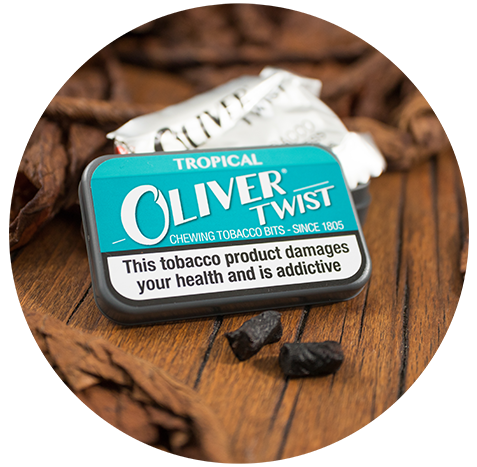 Nicotine is a natural constituent of the tobacco plant, and the nicotine content in Oliver Twist products origins in the tobacco leaves exclusively. We do not change the natural nicotine content. The average nicotine content in Oliver Twist’s tobacco bit Original is 5 mg. That may sound as a lot, but you do not absorb all of the nicotine when you use the bit. There will still be some nicotine left when you throw the bit away. As an extra way of ensuring its quality, we vacuum pack our tobacco bits in small bags. This prevents them from getting dry and losing their flavours. The tobacco bits stay fresh for up to one year after production – if the vacuum package is not opened. All boxes are marked with a best before date. During use, in order to preserve the moisture in the tobacco bits, we recommend that you let the bag stay in the box.